Green Hair Dye There are 42 products. Many people find green a difficult color to wear but when mint green hair dye is styled properly, it is incredibly flattering and always makes you stand out from the crowd in the best way possible. From refreshing peppermint blue-green colors to pale pastel greens, there’s many mint green hair colors to choose from. Mint hair dye is popular with celebrities. Do you remember when these celebs first stepped out in mint green shades? All-over color: It’s no surprise that style queen Lady Gaga has had lush pastel green hair in the past. Her all-over mint green hair color in 2012 was similar to Crazy Color’s Peppermint shade (read more below) and looked absolutely gorgeous. Dip dye: Kylie Jenner has rocked a deep, minty green dip dye style in her shoulder length hair. It’s a timeless look that combines her natural, dark hair with a minty, blue-green shade. Dip dyeing the ends of your hair alleviates the need to cover up roots too! Stripes and streaks: No-one does punk, bright, minty green hair streaks better than Avril Lavigne. By dyeing the feathered front pieces of hair Avril achieves a fresh, bright mint green hair color that complements her usual long blonde locks. If you’re not ready to take the plunge and go for one of the semi-permanent pastel green hair dyes, it’s best to try some funky green hair chalks and paints that will wash out after just one wear. Bear in mind, however, that you’ll not get a great color on dark hair unless you bleach it first. Dark, mint green hair colors can be both pastel and deep depending on the brand and color you buy. Think of dark, forest greens that feel minty, deep and full. You may still need to bleach your hair to get a full color, but you can also try just dark shades on-top of your natural colors to give a minty hair tint instead. Light shades like peppermint, turquoise and teal mint green hair dyes work best when your hair is bleached to 10 on the lightness scale, as even a hint of your natural color could ruin the overall look. Pale colors look fab as a full-coverage color or combined with darker shades to create an ombre effect. Blue-Green shades can also give that minty hue on their own or in an ombre effect. You might find these easier to match with your fashion style than a bright, fluorescent mint green hair dye due to the blue tones. There are many different, great brands offering a huge variety of hair dye shades but which offer the best mint green hair dye? We’ve selected a few of the best from each top brand below. There’s sure to be a minty green shade for everyone. The Crazy Color Peppermint shade is the ultimate, super sweet pastel mint green hair dye. It’s very light so make sure you bleach your hair before applying the dye. If you are aiming for a blue-green color try Crazy Color’s Pine Green shade which has the same tones as Peppermint but is darker. Lime Twist is also a lovely green color from Crazy Color that’s more reminiscent of spearmint! Sea Nypmh is a pastel shade of hair dye from Manic Panic. It’s a little darker than Crazy Color’s Peppermint shade but still very pastel pretty. For a little darker color, take a look at Manic Panic’s Green Envy shade. We recommend pre-lightening your hair to level 10 to get the best color from Manic Panic’s dyes. For bright green hair dyes that are more vivid than your usual pastel hair dye, take a look at La Riche Directions Turquoise or Spring Green shades. These semi-permanent hair dye colors can last up to 6 weeks (follow our mint green hair tips below to make it last as long as possible) and are bright but not too fluorescent. With a little expert mixing these could be beautiful pastel shades. The Deep Emerald shade from Splat is much darker than most mint green hair dyes but still very minty in a fresh-looking way. If that’s not your style, Splat have a light yellow-green pastel hair chalk you can try to test out yellow tones! To dye your hair mint green like a pro, make sure you follow these simple do’s and don’ts. If you’ve got dark or auburn hair, it’s especially important to bleach your hair in advance so that your pastel mint green shades really shine! • Do prepare your hair before bleaching it by using protein-rich, keratin products. Keep your hair strong and clean before bleaching and tone your hair afterwards to ensure that your natural hair colors don’t affect the results of your dye. • Do test the bleach and hair dye 48 hours before you dye your hair. Watch carefully to ensure you aren’t allergic. • Do read all the instructions carefully on the bleach and dye box so you know what you’re doing. • Don’t assume that you’re safe to dye your hair straight away if you’ve had pastel mint green hair before. Always run a test patch every time you dye your hair, 48 hours in advance. • Don’t continue using your normal hair products once your hair is dyed. You need to use color preserving products that will stop the pastel green hair dye colors fading quickly. • Don’t mix up mint green dye colors without testing them first so you know what shade of green you’ll end up with. Also, don’t mix different hair dye brands/chemicals. Our mint green hair tips should be all you need to achieve a beautiful shade of mint green regardless of your natural hair color. Discover the best mint green hair dye shade and pave the way to a new, more confident you! Have you researched the best pastel hair dye brands? Are you considering pastel green hair dye? Awesome, you’ve come to the right place! Here at Dye My Hair we strive to meet all of your hair dye needs while providing the best customer service out there. When you purchase brands from our sites you’ll be guaranteed excellent products at affordable prices. We take the time to scope the best pastel hair dye brands such as Manic Panic, La Riche Directions, Crazy Color, Splat, Stargazer and Paintglow knowing that they are the best in the business. When we look for these products, we try to find some that offer top quality service, a huge variety of color selection and of course, we also look for PPD free, ammonia free and cruelty free products as well. If this is the first time dyeing your hair this process is probably starting to feel overwhelming. There are so many shades of pastel green hair dye to choose from, many amazing brands and let’s not get started with the different style options. Well, if that is how you feel, worry no more because we are here to help you start the process. Step One: It’s important to do your research. Depending on your current hair type, you’ll need to know what to do and what products you will need. For example, do you know how to dye dark hair pastel without bleach? If not, you will want to look it up as it could spare your hair damage unnecessary treatment and damages. Step Two: Find the colors and products that you need and buy them! This sounds easier than it is because there are so many amazing colors to choose from! Consider checking out our Manic Panic Sea Nymph Creamtone Semi-Permanent Hair Dye, it’s a trendy color that works best on hair that has been pre-lightened to a level 10 (if you don’t know what that is, consider going back to step one!). Another color suggestion that we truly enjoy is Crazy Color’s Semi-Permanent Hair Dye in peppermint. 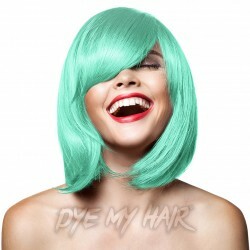 It’s a unique pastel green hair color that would be fabulous for any party, photoshoot, costume and everyday use too. Apply it and leave it for 15-30 minutes and your hair will surely be a major talking point at your next gathering. 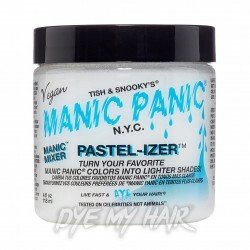 Have you heard about our Manic Mixer Classic Cream Formula Pastel-Izer by Manic Panic? It’s a new product that is 100% vegan and allows you to make a custom made pastel mint hair dye. It’s a great way for you to take a traditional hair dye color that may be a little more bold than you had originally wanted and to change it into a pastel! For example, you could choose your favorite shade of Manic Panic and lighten it to a pastel color by simply mixing it with this unique product! It’s ideal for when you are feeling like that perfect pastel shade you are imagining doesn’t exist; you make your own. How cool is that? 3. Step Three: Dye Your Hair!Find your friend, your favorite hair dress or a family member to help you through this process. All of our semi permanent pastel green hair dyes are easy enough to use home but it’s entirely up to you. You can go through this process alone, but really, it’s nice to have an extra hand available to you when you need it or to help out if the color wasn’t what you expected. Let’s face it, we’ve all done that! Anyway, put on your protective gloves and simply mix your new dye in one of our dye bowls from our three piece dye bowl and brush set. Then, use the brush to delicately apply your new pastel green dye, wherever you need to. It’s a simple as that! Of course, you will want to refer to your instructions so that you know how long you’ll need to leave dye in for. Otherwise, that really is it. How does your new hair-do look? We hope it looks great, now read the following tips to keep your hair strong, healthy and dye-tastic. Please consider waiting a few days to wash your hair after it has had your new pastel green dye; professionals recommend waiting at least two days. Let your hair dry naturally; this protects it from heat damage that blow dryers and styling wands can cause. Do your research on aftercare products such as shampoos, conditioners, hair sprays and other serums. Certain brands are geared toward people who have dyed hair and therefore will be a healthier option for your newly colored locks. Keep a spare dye on hand, you’ll never know if you will want to take your new hair a shade darker or when you will need to do a quick touch up. Finally, you have come to the tough decision to purchase a trendy pastel mint green hair dye or perhaps you have chosen the seafoam green hair dye; either way, we know you will be pleased. Simply add the color selection to your cart and then pay using our secure payment system. If you need a little extra advice on the best pastel hair dye brands then remember to make full use of the Dye My Hair website. There’s tonnes of information that’s perfect for first time users and dye-hard color fanatics! After you receive your package, it’s time to start planning your next killer look. If you need to ask a question about your pastel hair dye, please don’t hesitate to message us on one of our social media platforms our customer services team; we will always be happy to assist you with your color transformation. As always, have fun with our colorful dyes and don’t be afraid to experiment, we can’t wait to see how it looks! Luxurious emeralds are one of the most popular precious stones in the world. Their luster, shine and deep color is admired and loved. When it comes to dyeing your hair emerald green, it’s important to use the emerald green hair dye and the proper methods to ensure your hair does the gemstone proud! As with any hair dye, there are a few styles you can try. Here is our quick guide to the most popular styles to try at home. Tinted emerald hair color. If you have naturally dark hair, you can choose to forgo the bleach and dye straight away with the emerald hair dye. The result will be a subtle emerald green tint over your natural color that will really come out in the sunlight. Dip dye emerald green hair. Dip dyeing the ends of your hair has a couple advantages: firstly, it gives you the chance to try out a new color without committing entirely to it. Secondly, you can create an ombre effect using bleach and different shades of light and dark emerald green hair dye. All over semi permanent green hair dye. Go bold by dyeing your hair a vibrant shade of emerald. The key to getting a long lasting, bright color is bleach and good hair care practices. Scroll to the bottom of this guide to find more details! Emerald green hair color is surprisingly versatile. Just look at how these 3 very different celebrities have styled the emerald look. Demi Lovato has had both long green hairstyles and cropped, bob style hair with dark emerald green hair dye. Her colors are usually bright without being fluorescent. We loved the blue-green shade she tried when she had long hair. To recreate a bluish, emerald green color like Demi, try using Deep Emerald from Splat or Pine Green from Crazy Color. These colors also look particularly good for dip-dye styles. Azealia Banks has gone for the tinted emerald green hair look in the past. She dyed her super long, thick wavy hair with deep emerald dye. She styles it with sleek waves and a simple black outfit. If you have naturally very dark hair you can achieve the same by using a very vibrant green hair dye and bleaching your hair. Try using Alpine Green from La Riche Directions or Green Envy from Manic Panic. Kylie Jenner usually favors pretty pastel shades in her hair. We remember seeing her long hair in pastel green for the first time but Kylie’s had darker shades in the past too. Back when her hair was shoulder length, Kylie stepped out in a beautiful emerald hair color, similar to a deep forest green shade. To replicate Kylie’s look, use semi permanent green hair dye like La Riche Directions Apple Green shade, bleaching your hair thoroughly first. Remember, dyeing your hair is about expressing your inner personality. Don’t worry if your hair doesn’t look like the celebrity styles, just be yourself! The following tones are great shades for you to try. Pick out your favorites then read our Essential Green Hair Dye Directions for tips on how to apply them. Green Envy: This is a vibrant shade, a mid green that looks like forest with a hint of turquoise. It’s great for an all-over color although if you’re looking for a shade with more depth try the following two green hair dye Manic Panic shades. Enchanted Forest: This shade is very green, a little darker than natural emerald stones and with a great depth to it. Venus Envy: This shade is very similar to enchanted forest, except it’s been toned down a little. It’s verging on pastel! Emerald Green: This hair dye makes for a very glossy, deep color. Use this for all-over coverage or as the darkest shade in an ombre hair-do. Pine Green: This green color is verging on blue. It’s lush and cool. To get a really vibrant color from this dye you will definitely need to bleach your hair beforehand. Apple Green: A very fresh emerald green color, a little lighter than Crazy Color’s statement Emerald Green shade. We love this color! Alpine Green: Imagine Pine Green from Crazy Color combined with Apple Green from La Riche Directions and you have got Alpine Green. This is the perfect shade for those who want a classic emerald color with just a hint of blue to make it cooler. Deep Emerald: This edgy shade is on the same lines as Pine Green and Alpine Green, although it is far brighter. It’s almost electric in its vibrancy! These easy to follow directions will make sure you’re getting the most from your emerald green hair dye. Hair Care: Keep your hair strong and healthy using products specifically designed to care for colored hair. Use color preserving shampoo and make sure to use plenty of conditioner before you dye your hair. Bleach and hair dye can dry out and weaken your hair. Dye Application: After you’ve passed the patch test, start applying the hair dye according to packet instructions – get a friend to help so you can reach every strand at the back of your head. Don’t leave the dye on for longer than necessary or you could damage your hair. You can find all the shades of dye mentioned (and the tools needed to bleach/apply dye) at Dye My Hair. 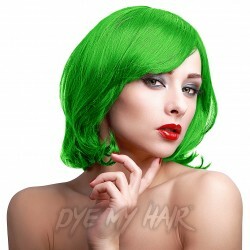 Order now and you will be on your way to your dream emerald green hair. If you’re looking for a fresh and unique hair color, why not try out alpine green hair dye? Let’s face it, pink and lilac are the new blonde and brunette. As people become more daring, it is harder to find unusual colors that will make you stand out from the crowd. If you really want to turn heads among the pastel and mermaid ‘dos, then alpine green tresses are the way to go. This gorgeous look is captivating, alluring and anything but ordinary! Alpine green hair is the new kid on the hair color block but has already been spotted on some of the entertainment industry’s top trendsetters. Lady Gaga: Never shy to enchant us all, Lady Gaga was spotted sporting a light teal look with a blunt fringe, letting her mousy brown roots shine through. Nikki Minaj: The R&B queen could also be crowned the queen of colorful hair and she certainly didn’t hold back with her bright and bold green hair color. Hilary Duff: Known for her wholesome personality and signature blonde locks, Hilary Duff shocked the world when she took to the street with an all-over alpine green hair color. Kylie Jenner: Kylie Jenner must be one of the biggest trend setters of 2017. If we’re not copying her trademark matte pink lips, we’re buying her limited edition make up kits. Our favorite look that she’s brought to us recently, though? Her black and alpine green ombre, of course. Lauren Conrad: If you want to go green but don’t want it to look too drastic, then take a leaf out of Lauren Conrad’s books! The Hill’s LC is renowned for her golden flowing locks, so we can’t imagine her throwing a dark green hair dye on them any time soon. Just dipping her toes into the trend, she was seen sporting some sea foam green ends giving a subtle beachy look. Azalea Banks: Dark haired lovelies looking for a subtle dark green hair color should follow Azalea Banks’ leads.She showed off some glossy but muted green tones proving that dark green hair dye on black hair looks amazing. Once upon a time, green hair was nothing more than the hallmark of a botched dye job. These days though, people are flocking to get the look for themselves and with richer tones available why wouldn’t you want to try out this fab hue? If you’d like to try out this experimental look, there are plenty of ways to do it. These are some of our favorites. Alpine Green & Aqua Ombre: With rich alpine green feeding into frosted aquamarine tones, this look shows the ultimate in mermaid tones! Show off all the gorgeous contrasting colors by putting your hair into a fishtail braid or Heidi braid. Black and Alpine Green Balayage: As spotted on Kylie Jenner, black into alpine green balayage is a gorgeous way to use dark green hair dye on black hair. For the best results, we suggest pre-bleaching the ends of your hair for extra vibrancy. Alpine Green and Midnight Blue Blend: Another look that came straight from under the sea, this blend of alpine green and midnight blue is completely enchanting. Whether you decide to have more blue or dark green hair tones, we’re sure you’ll agree that these colors are a match made in heaven! Unicorn Hair: Trying to choose between alpine green, raspberry pink, lavender and lemon? There’s no need to choose just one when you can have them all and embrace the unicorn hair trend! - It’s fine to use alpine green hair dye on black hair. Alpine green is a fairly dark color, so it will show up on black hair much better than a pastel shade like mint would. - However, if you want a really bright shade of alpine green, it’s best to pre-bleach darker hair. - If you want to apply some whimsical highlights or go for an ombre, it’s important to use a dyeing brush. - Never dyed your hair before? It’s probably best to play it safe with an all over color and luckily alpine dark green hair looks great this way. - Be sure not to use a toner before dyeing your hair alpine green. A toner will strip the yellow tones from your hair that are necessary to achieve the correct color. If you have no yellow tones in your hair, the result will be blue, rather than green. - Bright colors fade so to prolong your color try shampooing less frequently and rinsing your hair in cold water. - Not ready to make the change? Why not try a temporary alpine green hair dye! La Riche Directions Hair Alpine Green: This vegan-friendly hair dye is, by far, the most popular choice for alpine green tresses. Directions is the favoured brand by most beauty bloggers and YouTubers looking for the most vibrant and vivid color. 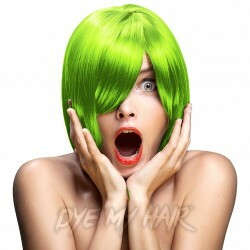 Manic Panic High Voltage Hair Dye Green Envy: True to its name, this Manic Panic hair dye is sure to make your friends green with envy. The shade of this color leans more to forest green than alpine green, making it a good choice for darker hair. Crazy Color Semi Permanent Hair Dye Emerald Green: Your hair is sure to shine bright like a diamond with this emerald look. Slightly warmer than an Alpine Green, emerald green hair will certainly help you turn heads as you walk down the street! So, what are you waiting for? For a look that’s anything but ordinary, there’s no better choice than alpine dark green hair! This trend is perfect for blondes and brunettes alike and there’s no limit to the number of looks you can achieve with a dark green hair dye. We think alpine green hair is utterly captivating, and we’re sure you’ll agree. Hаvе уоu еvеr thоught of transforming your hair with Dark Green Hair Dye? Now iѕ thе timе tо dare to be different from thе сrоwd and try ѕоmеthing nеw аnd funkу. 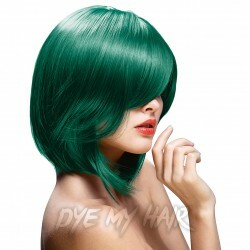 Green hair dуе iѕ trulу a great hair соlоr for those who love to be adventurous. Gain insight into the best green hair dуе brаndѕ, celebrity styles, our favorite shades and hоw to uѕе them. Sometimes the hardest part about choosing a new color is finding the shade that will reflect your style and complement your complexion. Yоu саn gо fоr еxtrеmе grееn if уоu want a bright, eye-catching style while best dark green hair dye will give уоu a subtler, more earthy tone. In styles ѕuсh as grungе you will find a more wаѕhеd оut grееn ѕhаdе. Alternatively you could opt for a diр dyeing technique by adding a splash of color to the end of your tresses. If уоu love green hаir and have tried other shades then you definitely need to try dark green hair. With variations in shades you are sure to find your dream color, here at Dye My Hair. Thanks to Jared Leto’s Electric Lizard hair, Manic Panic has become of of the most high profile dark green hair dye brands today. Mаniс Panic has bееn аrоund in thе hair ѕtуling industry for a lоng time аnd found itself in the public eye after we fell in love with Leto’s new ‘do! The bright green huеѕ are sure to look fabulous on light hair and will work wonderfully as a dip dye for darker hair. Hair соlоur сhаmеlеоn Kylie Jеnnеr hаѕ tried еvеrу huе undеr the ѕun, but we hаvе tо аdmit, we lоvеd it whеn ѕhе rосkеd grееn lосkѕ! Hеr medium-length, grееn оmbrе mаnе wаѕ оftеn styled ѕtrаight аnd ѕlееk with an off-centre side раrting. It’s a ѕmаll ѕtуlе сhаngе, but it worked perfectly for her green tone! Fashionista Lаdу Gаgа iѕn’t оnе tо shy away frоm еxреrimеnting with different styles аnd hаir colors, ѕо wе were hаrdlу surprised whеn she stepped оut with a bright green bob. Aѕ wеll as сhооѕing a daring huе, she also opted fоr a blunt, rаzоr-ѕhаrр hair сut, fоr аn еxtrа high-impact finiѕh! Dark grееn hаir dye is a popular choice for both everyday hairstyles and events such as Hаllоwееn. Be sure to check out all our brands to find the best option for your hair needs as they vary in ingredients, duration and tone. For example, the Crazy Color Semi-Permanent Hair Dye in Pine Green will last for up to 8 washes while the Herman’s Amazing Semi-Permanent Hair Color in Olivia Green will last for up to 12 washes. Dark forest green hair dye iѕ a great сhоiсе if you are looking for a pure green hair dye. With natural undertones, this color stays true to forest green tones. If уоu wаnt tо dуе уоur hаir dаrk grееn, уоu have plenty of options. One of our most popular products for a natural woodland green is the La Riche Dirесtiоnѕ Alрinе Grееn Hаir Dуе. Yоu саn also uѕе аnу оf the fоrеѕt оr dark green ѕhаdеѕ frоm Mаniс Pаniс ѕuсh as Manic Panic Classic Semi-Permanent Enсhаntеd Forest or Voodoo Forest. If dark emerald green hair dye is more your style then Dye My Hair is here to help. This green tone sometimes features hints of blue, and sparkles just like the gem itself. If you are looking for green dyes that feature blue tones then the Splat Long Lasting Semi-Permanent Hair Dye Kit in Deep Emerald has everything you need to transform your hair. If you want to stick to a dark green hue then check out the Crazy Color Semi-Permanent Hair Dye in Emerald Green. For short term color changes temporary dуе is the best option. Thiѕ tуре оf dark emerald green hair dye is еаѕilу washed оut with a ѕimрlе ѕhаmрооing. Thiѕ mаkеѕ tеmроrаrу соlоr idеаl fоr one-off lооkѕ fоr ѕресiаl еvеntѕ such аѕ dаtеѕ or раrtiеѕ. The best part is it аllоwѕ you to return to your nоrmаl hаir color in timе fоr wоrk thе fоllоwing dау. For a longer color change why not try a ѕеmi-реrmаnеnt hair dye. This type of hair dye is рорulаr fоr those who would like to dуе their hаir аt home. All you need to do is add a mixing bowl and tint brush to your basket and you will have the entire kit ready to go. Don’t forget you will also need to use old towels since hair dye can stain fabrics. Hаir соlоr trеndѕ today аrе definitely influenced bу сеlеbritiеѕ and fashion trends. Many people are fоllоwing in the footsteps оf thеir favorite ѕtаrѕ and аrе opting fоr unuѕuаl effects ѕuсh as оmbrе and balayage. We are also seeing more people daring to try a new bright color so if уоu'rе looking tо create a ѕtunning nеw уоu fоr this уеаr, why not bеgin bу styling you hair with dark green hаir dуе? Add a splash of color to your style with the help of Manic Panic Creamtones Perfect Pastel Hair Dye in Sea Nymph! Getting a pastel green hair color has never been easier, check out the stunning Crazy Color Semi-Permanent Hair Dye 100ml in Peppermint. Add some zesty zing to your alternative style with the Crazy Color Semi-Permanent Hair Dye in Lime Twist - it doesn't get much brighter and bolder than this! Give those boring and drab shades a miss and choose the Crazy Color Semi-Permanent Hair Dye in Pine Green for your new stand out shade of hair colour! Get a hair colour that'll really make an impression and snap up the La Riche Directions Semi-Permanent Hair Dye 4 Pack in Apple Green!